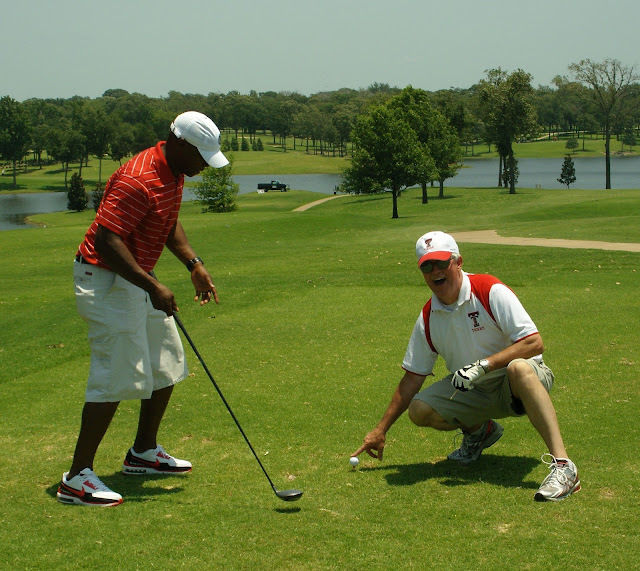 Yesterday the Twin Lakes Golf Course in Canton, TX hosted the Terrell Athletic Booster Club golf tournament. Twenty-five teams helped raise funds for the booster club and hopefully had a good time doing it. Below are the booster club volunteers who have been meeting for months to put on the event. I'm in the picture, but all I did was take pictures. More pictures from the day are at www.ihigh.com/terrelltigers. Superintendent of Schools Kelly Rodgers helps out new AD/Head football coach Kevin Wilson off of the tee box.